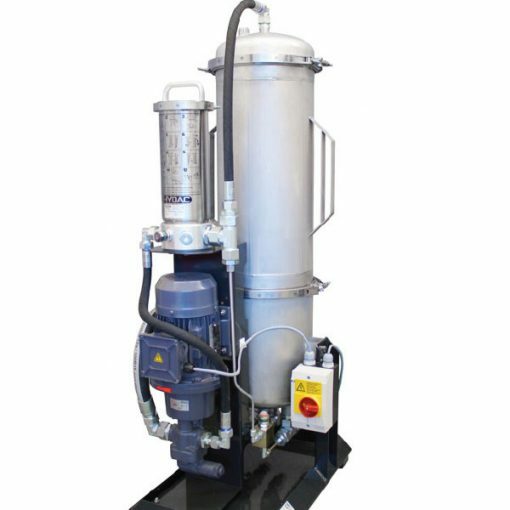 The Low Viscosity Unit LVU is for offline filtration. Indeed, the LVU removes solid particle contamination and free water from diesel fuel. Diesel fuel is often subject to long storage periods, especially in tanks which may be used infrequently. As a result, there are often deposits of solid particles and water on the bottom of the tank. Therefore, they can damage pumps and sensitive components when switching on the motor. In addition, over an extended period of time, free water in a tank provides a breeding ground for diesel fuel pests (microorganisms such as bacteria, algae, fungus, etc…). Both can quickly lead to blockage of the machine filter and to damage to diesel injection system components. The consequence: impermissibly high levels of pollutants from the combusting engine. This leads to high costs for w\downtime, spare parts, maintenance, and repairs. Therefore, the use of the Low Viscosity Unit LVU minimises contamination to a system and prevents expensive system downtime. It also helps to avoid the necessity of early and expensive disposal of diesel fuel.